Situated at the entrance to Geneva, this top-of-the-range apartment offers a haven of peace, at the heart of a modern and fashionable residency. PORCELANOSA, expert in prestigious fittings, is responsible for the refined and top-quality interior. The living area of approximately 56m² with open kitchen leads into 2 beautiful bedrooms and parental suite; a pleasant terrace with view and swimming pool with a solarium. The garden approximately 300m² is perfectly landscaped to fit in with the unique architecture of the residency. In addition, the residency enjoys a Nippon-style « walking » area combining co-existence and harmony. 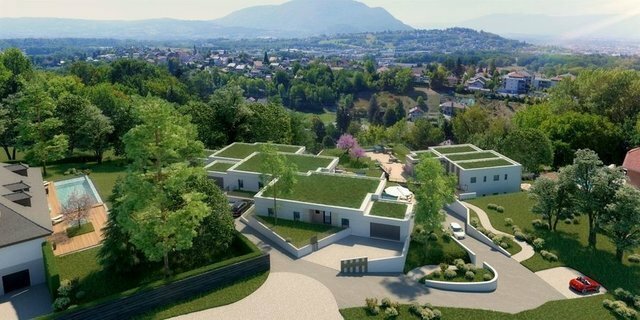 Double garage – Cellar – Videophone – Swimming pool – Situated at the entrance to Geneva - VEFA – Estimated delivery during 2020 Contact us for further information regarding what this residency has to offer. The highlights of this prestigious property: - Proximity to Geneva, in a haven of peace - Design and modern residency - Pleasant terrace with solarium and swimming pool - Nippon walking area - Landscaped garden De Meyer Immobilier | Sotheby’s International Realty, your expert in sales and rent of luxury property in Annecy and its surroundings.